The ARGIA is available for one to four hour private charters any day of the week from May to mid-October. You depart from the quaint seafaring village of Mystic, CT and sail in calm and protected waters. Argia accomodates	49 guests and is US Coast Guard Inspected. For business or pleasure, a sail aboard our traditional windjammer is a unique way to celebrate a special occasion. Corporate entertaining and teambuilding, birthdays, weddings, and family reunions are all easily accommodated aboard ARGIA. We customize your cruise to suit your needs and will work to ensure the success of your function. ARGIA's spacious deck has seating for you and all your guests, as well as plenty of room to move around. 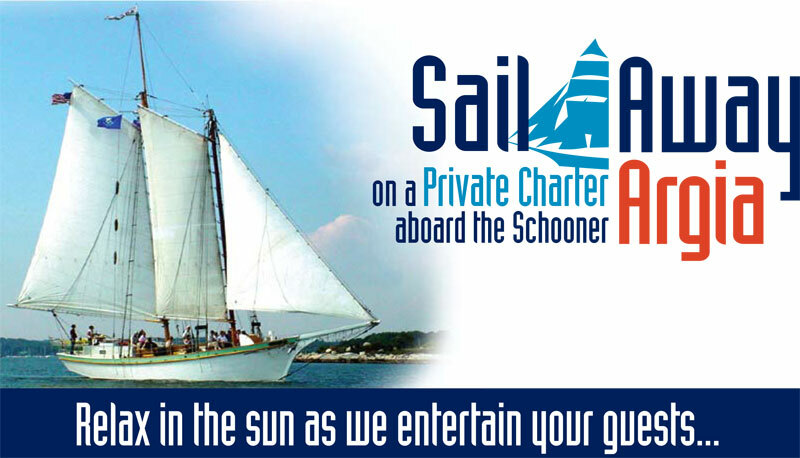 Charter price is based on time of day, time of week, and time of year. Please see our rate sheet for current rates. A 15% crew gratuity (which you may increase if you wish) will be added to your final payment. We require a 50% deposit within ten days of reserving a cruise, or at the time of booking if within 30 days of your charter. Your final payment is due 14 days before sailing and is NON-REFUNDABLE. This booking will not be held beyond 5pm on that date without final payment of charter price and 15% crew gratuity. In the event of bad weather, we may cancel the cruise and you will promptly receive a full refund. If it starts raining in the middle of a cruise, we will return to the dock and pro-rate your sailing refund. Food charges will not be pro-rated. We do not cancel in the event of cloudy weather or very occasional drizzle. If YOU cancel more than 30 days before your charter, we will refund your 50% deposit, less a 6% cancellation fee. If you cancel less than 30 days before your charter, your 50% deposit is NON-REFUNDABLE. No refund of charter cost will be given if you cancel 14 days or less before your sailing date. Charter rates are only for the boat and do not include food. You may either provide your own food and beverages, or choose from our Catering Menu (click the "Contact Us" button on the left side of the page and request the current Catering Menu). We do not serve or sell alcoholic beverages aboard ARGIA, but you may bring your own beer or wine (we do not allow hard liquor onboard). You may also order from local suppliers, who will deliver to our dock. We have a large ice chest on deck where you can chill your drinks in our block ice. We provide lemonade, beverage napkins and paper cups. Please remember, when considering musicians and their instruments, that music cannot be amplified aboard ARGIA, and deck space is limited. For an additional fee, we will book an excellent local musician for your private charter.